India Lion are the pride of the country and nation. India is the only nation in the world, which conserved a significant number of Indian lions. Throughout the history, lion has been the symbols of power and bravery. Its image in India's national emblem and neighboring country Shri Lanka's national flag. 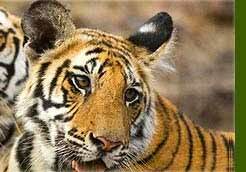 That is what Indian government has made tremendous efforts to preserve them and boost their breeding. Indian lions are one of the seven sub-species of lions found only in India. 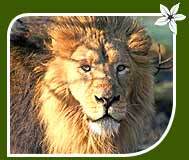 Originally, they are subspecies of African lions which split perhaps 100,000 years ago and spread in all over Asia. After successive attacks on their natural habitant, they are wiped out from the surface of Asia, except in India where they all are crowded in Gir National Park in Indian state of Gujarat. Indian lions is some distinctive features in comparison to African lions. Generally, the length of male reaches to 170-240 cm while of female 140-170 cm. Tail attributes a unique regal feature to it. The tail of Indian lion is usually 70-105 cm. All around the neck, it wears a majestic mane making a crown on the head of it. It lives around 16-18 yrs. Indian lions can be seen in the forest grounds of the Gir National Park. Some time they also climb on the trees but most of the time you will find them in open grasslands or forests. As lion is king of the jungle, it excitedly run behind the hunts like wild pigs, cattle, antelope and deer in the wild and jumps in the air grabbing the neck of the hunts and killing them by his sharp teeth and claws. Our lion is fond of this adventure. 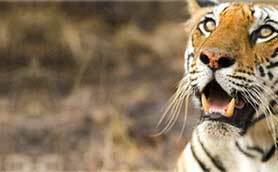 Government of India is very active for the protection and conservation this king of beast. 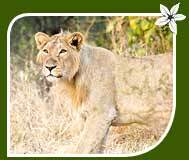 It has especially developed the Gir National Park and Lion Sanctuary, which is collectively known as the Gir Protected Area (PA). It is now the last bastion of Indian lion all over the world and harbors more than 300 hundred lions with full majesty. Recently, Government of India is in serious efforts to also introduce them in other neighboring sanctuaries in Madhya Pradesh.